Other Notes: 15 IBUs. Hops – Hallertauer Tradition and Magnum. Malts – 60% wheat malt, 40% barley malt from the region of Kelheim. Brewer Description: (from website) Stronger than strong. Powerful aromas and an intense flavor. Mahogany, nearly black Eisbock. The aroma reminds of ripe plums with a hint of bitter almonds and marzipan displaying strong characteristics of banana and clove. It is full and warming on your palate. The ideal digestive after a great dish. 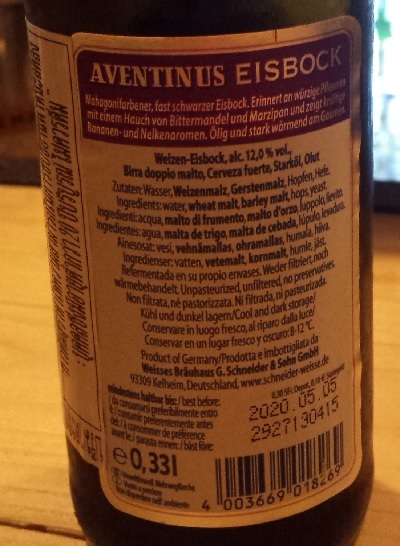 Aventinus Eisbock is a class by its own. 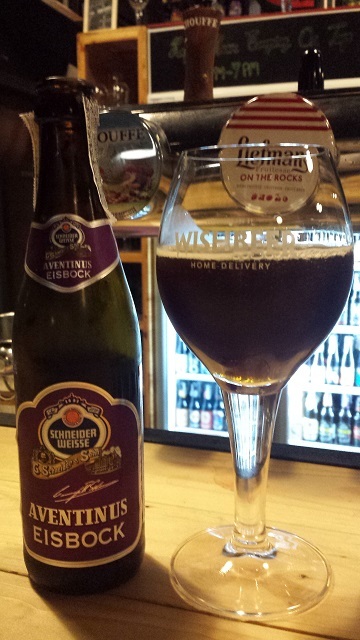 Legend has it that Aventinus barrels froze during transport in cold winter days. Brewers tasted the liquid that had remained unfrozen and were most deligthed. 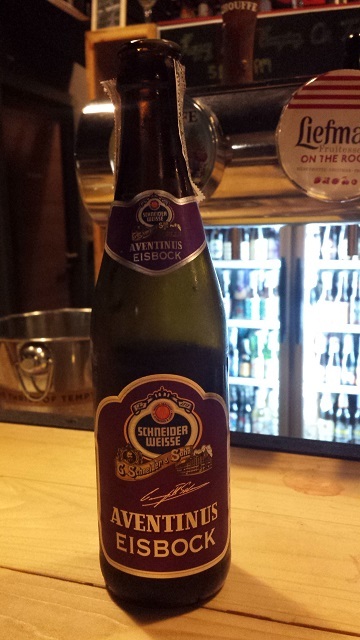 As the water freezes before the alcohol, what remains is a concentrated Aventinus – concentrated in aroma and in alcohol. We can offer this delight at any time of the year. Intro: A 330ml bottle with a best before date of 5th May 2020. Using Tap 6 as its base is a very good start. Appearance: It poured a dark brown colour with a reddish/purple tint. There was barely any head other than a thin tan coloured layer and not much lacing. Aroma: Sweet plum, grape, bubblegum, caramel with some light booze. Taste: Dark fruits, grape, plum, prune, bubblegum, syrup. Mouthfeel: Mid to full bodied with high carbonation. Overall: My first Eisbock and a very good one at that. Considering its 12% ABV, although there was a small amount of alcohol in the nose, there was none in the taste. Very easy to drink and wish I had a few more bottles on hand to age.